A quiet, freely moving, balanced, articulated, all steel mic boom. 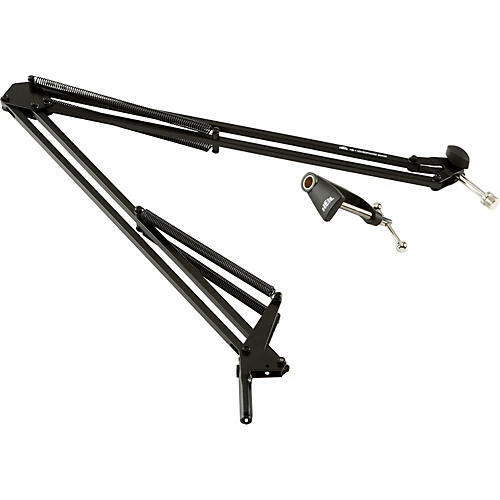 The HB-1 is an articulated arm, which is of very substantial steel channel structure and balanced by four external springs. Capable of supporting microphones up to 2.5 lbs, the HB-1 has a reach of 40". The HB-1 Boom accepts all of the standard 5/8" -27 threaded microphone hardware. The threaded chrome stem can be secured into its needed position by tightening the thumb screw. The HB-1 is shipped with a brass lined 'C' clamp mount that accept up to a 1.5" thick table. The HB-1 will fits all of the brass lined Heil mounting accessories. Order this studio solution today!